When it comes to electronic theses and dissertations, Ohio is unparalleled in its dedication to its students and their research. The OETDA Conference, held on March 6th, 2015, is proof. Though it is a smaller conference, the graduate school and library attendees were engaged and fostered discussion throughout the day, during sessions and breaks. The buzz in the room was palpable as people shared how they help their students and care for their research as ETDs after graduation. The day began with exciting news of Ohio being selected as the next state to host the national USETDA Conference in 2016. The conference will be held in Columbus and is being hosted by OETDA, with supplemental help statewide as many schools want to be involved with planning. What a wonderful opportunity to show everyone our community supporting ETDs and put it to use. Next, Austin McClean, Director of Dissertation Publishing at ProQuest, demoed the new Dissertations Dashboard which drills deep into the statistics of who uses your institution’s ETDs. Available to those who purchase PQDT Full Text or Global and the statistics can be broken down to outside of campus and on-campus as well as provide granular download trends, with the ability to compare your institution with its peers. In the works is an Authors Dashboard for people who have uploaded their ETD to ProQuest and Academic Genealogy that shows professors advising on dissertations and a family tree of researchers. The keynote speaker unfortunately couldn’t make it to the conference itself due to a snow emergency but he was able to give his talk virtually. John Hagen, consultant/owner of Renaissance Scholarly Communications, discussed current and future ETDs trends, including ORCID, Vireo 3 release, security issues, open data, and publishing perils. Since we are in an age of great technology and interconnectedness, we must make the most of the tools and possibilities to support students and promote their ETDs and research to the best of our abilities. After lunch, I provided a year-in-review for the OhioLINK Electronic Theses and Dissertations (ETD) Center which surpassed 52,000 ETDs this fall. A few of the OH-TECH developers, who make the ETD Center possible, attended and helped field questions with me. Tim Watson, Director of Graduate School Graduation Services at The Ohio State University, discussed the formation of the OhioLINK ETD Council, his role as Chair, and the work the group has done thus far. Graduate and library staff from member institutions are on the council and serve as a liaison between the wider community and OhioLINK and the developers. Susan Banoun, University of Cincinnati, lead a lightning round panel discussion about library and cataloging trends for ETDs. Emily Hicks, University of Dayton, Sevim McCutcheon, Kent State University, and Sean Crowe, University of Cincinnati, shared their workflows within the library and relationships with the graduate school when dealing with ETDs and providing records for each item into their local catalogs. Next, Emily Shaw, The Ohio State University, briefly described their latest project of digitizing theses to upload into the ETD Center. Dissertations were done previously and were not nearly as many. Others around the US have done similar projects, including Oregon State, University of Florida, and Arizona State. To wrap up the day, Lou Haines, University of Miami, shared her experience running a 3 Minute Theses (3MT) competition on campus and played the video of the winning talk. UM is the first school within the state and she encourages others to get involved, offering to help provide resources to get it started on other campuses, hoping to create a network for competitions like other regions in the US. The 2015 competition is underway now, with 27 total participants and 10 finalists who can be at any point in their research process, most from the sciences but several English PHDs are competing as well. This reminds me of Speech in high school and the weekend meets, although 3 minutes makes 8-9 seem like an eternity. What a great way to learn to hone your research to a digestible, brief synopsis, and possibly win some prizes in the process. OETDA is a wonderful conference and opportunity to spend a day with a niche group who cares about their student and their ETDs. I can’t wait for next years! During the first week of December, I participated in OCLC’s second Developer House with nine other academic librarians and library IT staff. We spent the week working with OCLC APIs, especially WorldCat Discovery API which is still in beta. Our group of developers ranged in experience and technologies that complemented each other well for the various projects that we worked on. In addition, several OCLC staff spent the week with Dev House, offering support and knowledge whenever possible and many others were on call as needed. This provided us with the opportunity to dig into the projects and even create working demos with some functionality by the end of the week. Even with a team, it is a tough feat to pull off but fun none-the-less. My team’s project searched the Discovery API information with third party information to generate relevant content that the library already owned. Our idea was to create a quick display of library material based on a particular topic, person, or place. After considering many third party sources, we selected DBpedia for its organized data and easy-of-use, then based the information on a date in history. This gave us a good amount of results and flexibility since dates are associated with many topics in a multitude of ways (birthdays, commemorations, releases, publications, etc.). Our group has a guest post on the OCLC Developer Network, if you’re interested to know more details and watch a short video demo of our project. Trying to list off all of the things that I learned would make this post much too long, so let’s stick with the top three. First and foremost is SPARQL, an RDF query language that searches for and manipulates data and is customizable to allow for getting back desired information in a specific way. While learning and then mastering SPARQL queries well enough to use them took some time, figuring out what information was available and how we wanted the data was the main focus. Thankfully, OCLC has an SPARQL expert who helped us with this, which meant that we had the chance to create and hone several different queries to use in our application. Apache Jena is a good SPARQL tutorial and the SPARQL Explorer is great for trying out queries. Second is GitHub, a website for sharing and collaborating on code. Before Dev House, I had signed up and looked at some of the tutorials to get started but it helped having a project with a time restriction to put GitHub to use. There are multiple ways to use GitHub for whichever you prefer: online on the website, through the client, or in a terminal. It reminds me of DropBox in that it keeps everyone’s code updated but it is more complex and offers much more functionality along with the ability to fork, or branch, a project. Finally, there is an engaged community of library coders and it was exciting to spend a week with several of them. 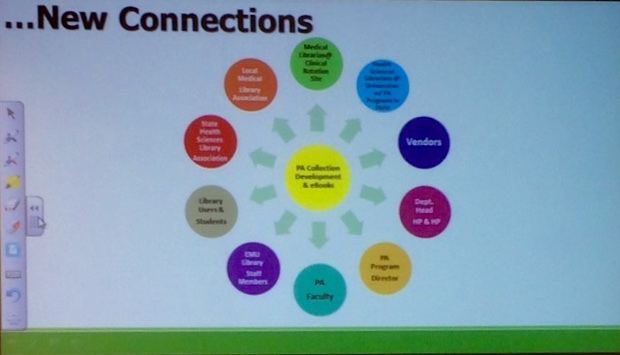 Even though we all are at different institutions, librarians still find to stay connected wether it be through OCLC Developer Network or Code4Lib Annual or Regional conferences, or other outlets. If you want to be involved more with coding and technology, just jump in. And there is bound to be another awesome OCLC DevHouse around the corner to apply for. A 40th anniversary is quite a feat and this year’s ALAO was no exception, complete with a cake with raspberry filling to represent the ruby milestone for the four decades. Congrats, and here’s to 40 more! ALAO is the Ohio Chapter of ALA’s ACRL (American Library Association’s Association of College and Research Libraries division). Though the unifier is higher education libraries, the various topics of sessions show the range of interests and needs of academic libraries. Courtney Young, current ALA President, opened the conference as the keynote speaker with her address focused on diversity and our ability as librarians to further diversity not only in our professor and materials in our libraries but also on-campus and even in the wider communities. Outreach is one of the means that can manifest in many different ways including, as she pointed out, working with campus study abroad programs. For my first session, Ellizabeth Bucciarelli (Eastern Michigan University) in her talk Creating Tangible Connections Using the Intangible Library, walked through the entire process of setting up a new program collection. With such a unique opportunity, she reached out to administrators, faculty, relevant associations, and others touched by this new department program in order to create a strong, open-communication foundation to ensure future success and funding. Among the concerns discussed, inflation for eResources was an important one so that everyone involved knew how library vendors and publishers function so that the new digital collection could remain robust for years to come. Elizabeth Bucciarelli’s slide exemplifies the culture of librarians working with people outside of the library, especially concerning resources. With Twitter still a vital tool for librarians, Diane Schrecker (Ashland University) and Kaylin Tristano (Brown Mackie College)’s session titled Engaging Tweets: Twitter as Personal Learning Network covered the basics as well as enumerated the different ways in which to participate on Twitter and useful tools. New to me were Twubs and Tweetchat, additional resources that make use of Twitter content but allow for more customization and monitoring of particular hashtags. 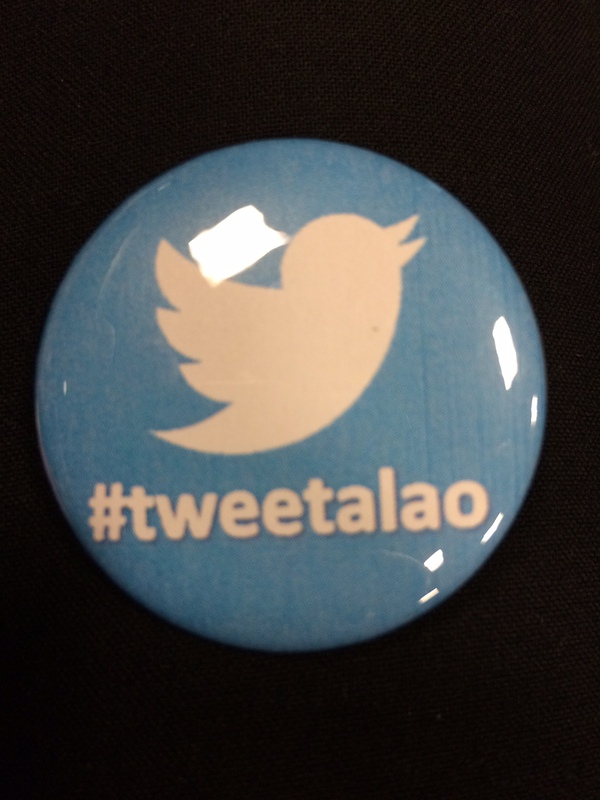 All conferences have swag, but the session on Twitter even had their own: buttons! After lunch were a brief round of table discussions for half an hour. Empowering Communities through Collaborative Innovation: Doctoral Student Perspectives on Knowledge Navigation in the Academic Library caught my attention. Three Kent State University doctoral students presented their research and fielded a few questions, although more time would have been nice since they all had interesting topics. Shelley Blundell researches remedial undergraduates and there is not much about their information seeking needs and behaviors. Much more than motivation, hopelessness tends to be a main hurdle that remedial students face and most do not overcome. Omer Farooq discussed integrating scholarly communication in to information literacy instruction, which includes not only students but faculty as well. Heather Flynn wrapped up the round table with her research about serving the international students in academic libraries and considering ways to “internationalizing” the library. Next up: poster talks and cake. What a great combination in the same room, to socialize and hear about all of the wonderful initiatives throughout Ohio and tips/tricks for working effectively. Joshua Neds-Fox and Michael Priehs (Wayne State University)’s Informing Authors: Outreach Strategies for Engaging Faculty in Scholarly Communications Issues session articulated their efforts to engage faculty about scholarly communication and their institutional repository (IR), make it easy for the faculty to post their work into the IR, help develop an open access (OA) policy for campus, and provide opportunities of OA journals both for faculty and students. WSU is lucky to have a department dedicated to this issues. As a final session, Tina Franks (OSU)’s Trusted Advisor: Borrowing Ideas from Corporate America to Build Professional Success shared her experience of building stronger relationships with her library users to serve their needs and add value for them. Her inspiration was drawn from a business book of the same title, which focused on earning trust, giving advice, building relationships, engaging new constituents, and changing from transactional to relationship service. 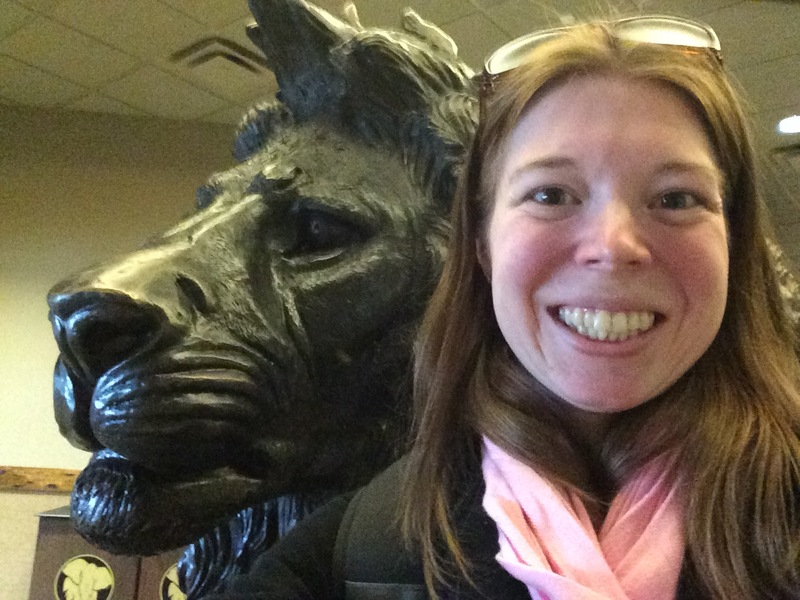 Kalahari Convention Center lion statue stands steadfast, despite the snow flurries outside. Thankfully, while the weather was cold and snowy, the Kalahari Convention Center was filled with the warmth of ALAO. Despite the Kalahari Convention Center’s African safari theme, the Ohio weather decided not to coordinate for ALA-O. However, the active and engaged librarians keep the conversation hot and the session abuzz. Char Booth, Director of Research, Teaching, & Learning Services at the Claremont Colleges Library, lead the ALA-O pre-conference event about library advocacy and outreach, covering the theoretical as well as practical, making it a fruitful session. Having seen Char speak before, she has a vibrant presence and fun yet wise presentation style that draws people to her talks; this was certainly part of the reason for some attending the pre-conference. Her slides are available on SlideShare. To start off, Char defined advocacy as simply “making people care” and outreach as “making people aware”. These concise yet broad definitions allow for bigger discussions and ideas about what is possible. With libraries, what comes to mind first is promoting resources and services to users but there is so much more to consider and people to keep in mind. As part of the workshop, Char provided a worksheet to generate reflection and table discussions to learn from each other. To make it personal, the first activity was a mini SWOT analysis for a particular advocacy issue or idea. SWOT stands for Strengths, Weaknesses, Opportunities, and Threats. It is such a great idea because reasoning and logic guide the idea to help articulate not only the benefits but also consider any counters against it and prepare for them. This allows for strong and direct advocacy in any situation. As an alternative, some might prefer the quicker WIIFT method (What’s In It For Them?) in order to make the sell matter for the audience. Outreach, then, makes use of the advocacy and Char certainly interrogated it from many angles and offered numerous possibilities. Two main approaches are DIY (Do It Yourself) and LSEDIFY (Let Someone Else Do It For You). For the benefits and concerns for each style, check out Char’s awesome slides at the link provided earlier in the post. Part of her comparison included the feel for particular audiences that each brings to the table, which is important to consider to ensure that the outreach resonates and is effective, such as a professional annual report. Whether fun or formal, non-scripted or instructional, on-the-fly or well-funded, there are great ideas going on at libraries no matter what the context. With its relaxed spirit and perfect weather, Claremont Colleges Libraries puts their mobile library cart and button maker through their paces constantly to go to their users and engage them. What fun, in the sun! If that isn’t enough, Char offered more resources and reading for those who want to learn more and steep further in inquiry and ideas, check out the ACRL Value of Academic Libraries: A Comprehensive Research Review and Report by Megan Oakleaf. Also, at the end of her slides, Char lists a few books of interest too. As a first-timer at ALA-O, I can’t wait to see what tomorrow holds! Follow the conference action virtually on Twitter with #ALAO2014 and the numerous session hash tags. The active librarian community in Ohio shouldn’t surprise me anymore, but it still does when I discover yet another local group or event dedicated to a niche aspect of libraries. Ohio IR Day on Friday, October 24, 2014 exemplified the communal desires of Ohio librarians. Even though this was the first time, there were over 30 participants for this all-day event, most from academic libraries with one from the Ohio History Connection (previously the Historical Society) and even a Kentucky librarian. As a part of Open Access week, Ohio IR Day focused on institutional repositories (IRs), online collections of digital material which could include anything from text to photos to videos. To begin the day, Ann Connolly from Bepress enumerated the needs and the possible work of students and faculty that can be met and housed in an IR. For example, while everyone agrees that big data is important, smaller data also requires organization and preservation to remain useful. Connolly then showcased numerous creative, novel ways in which Ohio uses IRs to display and disseminate even non-published items. I will highlight my favorites, though they all were amazing. The University of Dayton’s IR has photos and videos of mineral samples so that students can view them online in addition to lab setting, offering more flexibility. Cedarville University posts student photography portfolios and exhibitions, a perfect way to extend the reach of beautiful and though-provoking images. Finally, the College of Wooster captures oral history of local farmers, recorded by students to bring the community and local history into the education process. Current uses of IRs demonstrate that librarians as well as scholars have a broader consideration for what is beneficial as digital material in an online collection. The 10 lightning round speakers covered everything from set-up and servers to soliciting and scanning content. Again, I am only going to touch on a few speakers for this post. Lois Hamill from Northern Kentucky University discussed her process of gradually transitioning the University Photographer photo collection from single-computer access to a network to a website and now to an IR in order to better serve their users. It was interesting to hear about the different steps and the time it took to transition, since it is easy to take for granted online collections rather than consider how long and what it took to achieve the online presence. Elizabeth Shook from Wright State University discussed their innovative use of prepending EZProxy to their OpenURLs in the IR to allow for seamless use of material outside of it; the session even lasts beyond the first click so that users can easily traverse the IR and other resources without needing to login repeatedly. Marsha Miles from Cleveland State University shared her streamlining and automating their IR process, creating marcos and scripts and making use of Google Drive to help with batch processing and revision. The range of conceptual to technical talks provided a complex and overall complete survey of the various topics and aspects of IR. It was a great mix of speakers for such a day. The day ended with birds of a feather, the small group discussion, of particular topics surrounding IRs. In the content recruitment group, we had a couple of people who were just starting IRs along with many who have worked with IRs for a while so there was a lot of information sharing and cross discussion. One fact that a few confirmed is that adding ETDs to IRs drives views and downloads, as they have a wider reach in content and for others’ research than local collections. All of the small groups seemed just as chatty, filling the room with a hearty buzz despite it being mid-afternoon. Everyone’s passion for IRs, their content, and users was apparent and made the day that much more fun. As for takeaways from Ohio IR Day, the first that comes to mind is that the attendees of the event are wonderful resources themselves and willing to share what they know. The second is creativity abounds with infinite possibilities that IRs provide for sharing content and ideas, with many great examples shown throughout the day. This fabulous event was put on by Jane Wildermuth, with help from Elizabeth Shook and Andrew Harris from Wright State University and held at the State Library of Ohio. Many thanks goes to them for planning such a great day for librarians to share their experiences with IRs. Everyone in attendance agreed that this should be a regular meeting, with volunteers willing to help. Again, active Ohio librarians unite! I certainly look forward to the next Ohio IR Day.